The Navigation Tree is on the left hand side of the RM Studio and the tree groups the various functions into Common Entities, Assessment and Treatment, Business Continuity Management, and Tasks and Responsibilities (moving to a web format). From the Navigation tree you can access all these functions by double clicking on them. You can also adjust the space the tree uses by sliding the dividers left or right, and by double clicking the divider to close the tree view. Double click any item in the tree to open. The now opened item will display in the work space to the right of the tree. For every item you open a new tab will display above the work space. Clicking back and fourth between tabs is convenient and efficient, when working with RM Studio’s dynamic risk management capabilities. Once you have open an item from the Navigation tree, you will now shift to using the item (assessment, documents, assets, etc.) in the work space with the tabs. In the example below under the Risk Assessment tab, you need to double click on the specific risk assessment to open. 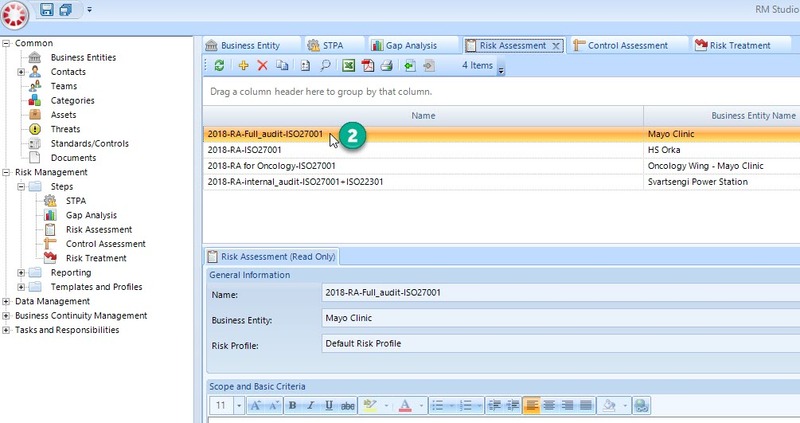 Once opened, the selected risk assessment opens another tab at the end of the first row of tabs and a second row of actions tabs below the initial row. The second row of tabs only pertain to the opened risk assessment from the example. More details regarding the tabs and how to use properly are available in the next section.